Marriott Hotel waves the magic wand over homeless Filipinos and behold Christmas is warm and more beautiful. Yes the people behind Marriott Hotel plays "fairy-godparents" in support to Habitat for Humanities Philippines' cause of assissting families in need of a decent shelter. 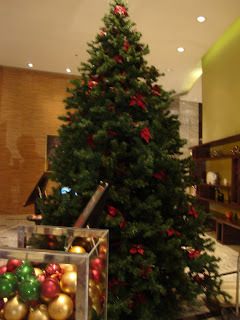 As the qoute goes, "Christmas is a season for kindling the fire for hospitality in the hall, the genial flame of charity in the heart," by Washington Irving, echoes on the lobby of the hotel, with all the Christmas adornments, Christmas trees on every hallway, gracious staffs and Christmas songs from the night's performers, really felt Christmasie when I walked in! But what was even more appropriate to that qoute was how charity had been the main point of the event. A certain Christmas tree was left plain and unlit, and here is were it will all come together. After a few hours it will be adorned by Christmas balls, lighted by the alluring Ruffa Guttierez, Pasay City Mayor Calixto and Marriot Hotel's Gen. Manager Richard Saul. The balls for decorating the tree will cost 200 pesos each, and guests can sponsor the worth of the balls, and the cost of all the balls will be donated to Habitat for Humanity Philippines. hors d'oeuvre were served and while we await for the spectacular program and Christmas tree lighting, I had to know who the man is behind the banquet. Some big shots were there, GMA station's VP, Rodrigo Cornejo and wife, Cory Quirino, Pasay City Mayor Antonio Calixto, Singapore Airlines Executives, Habitat Managing Director & CEO Ricardo Jacinto, celebs, Phoemela Baranda, Richard Gutierrez, Ruffa Guttierrez and Tim Yap who emceed the program. Similarly aside from the Christmas sweet feast, attractions like, Chinese Acrobat dancers and Laarni Lozada wowed us. And the final attraction, the Christmas tree lighting and ornating. Hats off to the organizers of the event, wishing both Marriott and Habitat for Humanity more charity and lives to change. Need not forget Chef Felino Afable, Executive Pastry Chef of Marriott for a spectacular display of desserts! What a party to kick off the Holiday Season. Good to know hotels such as Marriott supports different causes! Hey nice , delectable pictures! rubbing shoulders with the bigshots! please follow me also at wordpress! I love this post for Marriot!